Barack Obama already made the nearly obligatory stop at Garfield High School a few months back but made no attempts to sample any of the local comida. If any candidates return to East Los Angeles for a food photo opportunity, they could demonstrate multiple levels of multicultural authenticity by visiting The Hat for a pastrami dip and chili cheese fries. In East L.A. and the western San Gabriel Valley, everybody eats at The Hat. p.s. 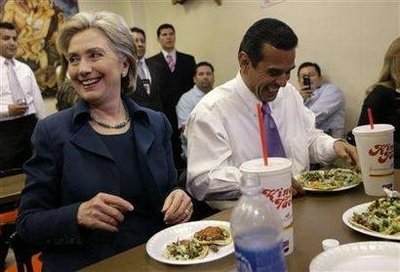 Something tells me Bill Richardson would have had no problems with the tamales or escabeche.